Among Christians, Lent (known as "Great Lent" in Eastern Orthodxy) is the forty-day period prior to Easter (lasting, in Roman Catholicism and Anglicanism, from Ash Wednesday to Holy Saturday). It is a time of somber reflection, fasting, and spiritual preparation to commemorate the death and resurrection of Jesus Christ. In particular, Lent is also a season of grief, known to Eastern Orthodox as the season of "Bright Sadness," recalling Jesus' painful crucifixion. This penitential period ceases with the celebration of Easter and new life. The forty days in Lent are traditionally marked by fasting from foods and festivities, and by other acts of penance. Historically, the three practices taken up during Lent were prayer, fasting, and almsgiving. Today, Christians often give up something they enjoy during Lent, or give time or money to charitable purposes or organizations. The Lenten period of forty days owes its origin to the Latin word quadragesima (meaning "forty"), referring to the forty hours of total fast that preceded the Easter celebration in the early Church. This nomenclature is preserved in Romance, Slavic and Celtic languages (for example, Spanish cuaresma, Portuguese quaresma, French carême, Italian quaresima, Croatian korizma, Irish Carghas, and Welsh C(a)rawys). The main ceremony was the baptism of the initiates on Easter Eve. The fast was in preparation to receive this sacrament. Eventually, the period from Good Friday until Easter Day was extended to six days, to correspond with the six weeks of training, necessary to instruct the converts who were to be baptized. In the late Middle Ages, as sermons began to be given in the vernacular instead of Latin, the English word lent was adopted. This word initially simply meant spring and derives from the Germanic root for spring (specifically Old English lencten; also the Anglo-Saxon name for March—lenct). In modern Dutch, the word for "spring" is still "lente," while the forty-days fasting period is called "vasten." With the imposition of Christianity as the state religion of the Roman Empire, its character was endangered by the great influx of new members. In response, the practices of self-renunciation during Lent were required of all Christians. In Jerusalem, near the close of the fourth century, classes were held throughout seven weeks of Lent for three hours each day. The less zealous of the converts were thus brought more securely into the Christian fold. It has also been suggested that the Lent fast may historically have originated for practical reasons: during the era of subsistence agriculture in the West, when food stored away in the previous autumn was running out, or had to be used up before it went bad in store, and little or no new food-crop was expected soon (compare the period in Spring which British gardeners call the "hungry gap"). The forty-day period of Lent has many resonances in biblical symbolism because the number forty is an important biblical number. The forty-days of Lent corresponds to the forty days Jesus spent in the wilderness when he was tempted by Satan before beginning his ministry. It also alludes to the forty days that Moses spent on Mount Sinai with God; the forty days and nights Elijah spent walking to Mt. Horeb; the forty days and forty nights of rain in the story of Noah; the forty years of wandering by the Hebrews during their Exodus from the Promised Land; and Jonah's prophecy of judgment, which gave the city of Nineveh forty days grace in which to repent. Lent personified at a Carnival celebration. 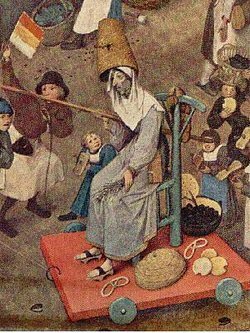 Detail of 1559 painting "The Battle between Carnival and Lent" by Pieter Bruegel the Elder. Although originally of pagan content, the traditional carnival celebrations which precede Lent in many cultures have become associated with the season of fasting if only because they are a last opportunity for excess before Lent begins. The most famous of pre-Lenten carnivals is Shrove Tuesday also known as Mardi Gras. Fasting during Lent was more severe in ancient times than it is today. Socrates Scholasticus (b. 380) reports that in some places, all animal products were strictly forbidden, while some Christians permitted fish and fowl. Others prohibited fruits and eggs, and still others ate only bread. In some places, believers abstained from food for an entire day; others took only one meal each day, while others abstained from all food until 3 o'clock. In most places, however, the practice was to abstain from eating until the evening, when a small meal without meat or alcohol was eaten. During the early Middle Ages, meat, eggs and dairy products were generally prohibited. Thomas Aquinas argued that "they afford greater pleasure as food [than fish], and greater nourishment to the human body, so that from their consumption there results a greater surplus available for seminal matter, which when abundant becomes a great incentive to lust." However, dispensations for dairy products were given, frequently for a donation, from which several churches are popularly believed to have been built, including the "Butter Tower" of the Rouen Cathedral. Today, in the West, the practice of fasting is considerably relaxed, though in the Eastern Orthodox, Oriental Orthodox and Eastern Catholic Churches, abstinence from the above-mentioned foods is still commonly practiced, meaning only vegetarian meals are consumed during this time in many Eastern countries. In the Roman Catholic Church it is tradition to abstain from meat every Friday for the duration of Lent, although fish and dairy products are permitted. On Ash Wednesday, it is customary to fast for the day, eating only one full meal with no meat, and if necessary, two small meals. On Easter Sunday, Catholics may cease their fasting and start again after they attend Sunday mass. Current fasting practice in the Roman Catholic Church binds persons over the age of majority and younger than fifty-nine (Canon 1251). Pursuant to Canon 1253, days of fasting and abstinence are set by the national Episcopal conference. On days of fasting, one eats only one full meal, but may eat two smaller meals as necessary to keep up one's strength (However, the two small meals must together add up to less than the one full meal). Parallel to the fasting laws are the laws of abstinence. These are binding on those over the age of eighteen. According to canon law, all Fridays of the year, Ash Wednesday and several other days of the year should be days of abstinence, though in most countries, the strict requirements of abstinence have been limited by the bishops (in accordance with Canon 1253) to the Fridays of Lent and Ash Wednesday. On other abstinence days, the faithful are invited to perform some other acts of penance. Many modern Protestants and Anglicans consider the observation of Lent to be a choice, rather than an obligation. Nevertheless, Lenten practices (as well as various other liturgical practices) are more common in Protestant circles than they once were. Today, Protestants may decide to give up a favorite food or drink (e.g. chocolate, alcohol) or activity (e.g. going to the movies, playing video games) for Lent, or they may instead decide to take on a Lenten discipline such as devotions, volunteering for charity work, and so forth. Roman Catholics may also observe Lent in this way, in addition to the dietary restrictions outlined above, though observation is no longer mandatory under the threat of mortal sin. Many Christians who choose not to follow the dietary restrictions cite 1 Timothy 4:1-5 that warns of doctrines that "forbid people to marry and order them to abstain from certain foods, which God created to be received with thanksgiving by those who believe and who know the truth." In the Roman Catholic Mass, Lutheran Divine Service, and Anglican Eucharist, the Gloria in Excelsis Deo is not sung during the Lenten season, disappearing on Ash Wednesday and not returning until the moment of the Resurrection during the Easter Vigil. On major feast days, the Gloria in Excelsis Deo is recited, but this in no way diminishes the penitential character of the season; it simply reflects the joyful character of the Mass of the day in question. It is also used on Maundy Thursday. Likewise, the Alleluia is not sung during Lent; it is replaced before the Gospel reading by a seasonal acclamation. Traditionally, the Alleluia was omitted at Mass beginning at Septuagesima, but since the Second Vatican Council, it has become customary to retain it until Ash Wednesday, although many traditionalists continue to practice the former custom. Ash Wednesday is the first day of Lent in Western Christianity. Clean Monday (or "Ash Monday") is the first day in Eastern Orthodox Christianity. The fourth Lenten Sunday, which marks the halfway point between Ash Wednesday and Easter, is sometimes referred to as Laetare Sunday, particularly by Roman Catholics. The fifth Lenten Sunday, also known as Passion Sunday (however, that term is also applied to Palm Sunday) marks the beginning of Passiontide. The sixth Lenten Sunday, commonly called Palm Sunday, marks the beginning of Holy Week, the final week of Lent immediately preceding Easter. Wednesday of Holy Week is known as Spy Wednesday to commemorate the days on which Judas Iscariot spied on Jesus in the garden of Gethsemane before betraying him. Thursday is known as Maundy Thursday, or Holy Thursday, and is a day Christians commemorate the Last Supper shared by Christ with his disciples. Good Friday follows the next day, on which Christians remember His crucifixion and burial. In the Roman Catholic Church, no Mass is celebrated after Holy Thursday until the Easter Vigil. Services held are purely commemorative in nature and do not include communion. Holy Week and the season of Lent, depending on denomination and local custom, end with Easter Vigil at sundown on Holy Saturday or on the morning of Easter Sunday. In many liturgical Christian denominations, Maundy Thursday (also called "Holy Thursday," especially by Roman Catholics), Good Friday, and Holy Saturday form the Easter Triduum. In the Roman Catholic and Anglican traditions, the altar linens and priest's vestments are violet during the season of Lent. However, during the holy days the linens often change. There are some Christian denominations that do not practice Lent and see it as an obscure tradition practiced without Biblical merit. In Eastern Christianity, Great Lent is the most important fasting period in the church year which prepares Christians for "Holy Pascha" (Easter). Although it is in many ways similar to Lent in Western Christianity, there are important differences in the timing of Lent (besides calculating the date of Easter), the underlying theology, and how it is practiced, both liturgically in the church and personally. Before Great Lent itself, there is a five-week Pre-Lent season, to prepare for Lent. A special service book called the Lenten Triodion begins to supplement or replace the regular services. This book is used until the lights are extinguished at the Paschal vigil. (Ash Wednesday is not observed in Eastern Christianity) On three successive Sundays, Zacchaeus, the Publican and Pharisee, and the Prodigal Son are commemorated. Next comes Meatfare Sunday (its proper name in the typikon is Sunday of the Last Judgment), the last day to eat meat before Pascha. It is followed by Cheesefare Sunday (its proper name is Sunday of Forgiveness), the last day to eat dairy products before Pascha; on this Sunday, Eastern Christians identify with Adam and Eve, and forgive each other in order to obtain forgiveness from God, typically in a Forgiveness Vespers service that Sunday evening. It is during Forgiveness Vespers that the decor of the church is changed to reflect a penitential mood. Observance of Great Lent is characterized by abstention from many foods, intensified private and public prayer, personal improvement and almsgiving. The foods traditionally abstained from are meat and dairy products, fish, wine and oil. (According to some traditions, only olive oil is abstained from; in others, all vegetable oils.) Since strict fasting is canonically forbidden on the Sabbath and the Lord's Day, wine and oil are permitted on Saturdays and Sundays. If the Feast of the Annunciation falls during Great Lent, then fish, wine and oil are permitted on that day. Besides the additional liturgical celebrations, Orthodox Christians are expected to pay closer attention to their private prayers and to say more of them more often. The Fathers have referred to fasting without prayer as "the fast of the demons" since the demons do not eat according to their incorporeal nature, but neither do they pray. Each of the five Sundays of Great Lent has its own special commemoration. The first Sunday is the Feast of Orthodoxy, which commemorates the restoration of the veneration of icons after the Iconoclast controversy. The second Sunday is kept in memory of Gregory Palamas. The Veneration of the Cross is celebrated on the third Sunday. John Climacus is remembered on the fourth Sunday, and Mary of Egypt on the fifth Sunday. During the weekdays of Great Lent, there is a liturgical fast when the eucharistic Divine Liturgy is not celebrated. However, since it is considered especially important to receive the Holy Mysteries during this season the Liturgy of the Presanctified Gifts, also called the Liturgy of St. Gregory the Dialogist, may be celebrated on Wednesdays and Fridays. At this vesperal service some of the Body and Blood of Christ reserved the previous Sunday is distributed. On Saturday and Sunday, the Divine Liturgy may be celebrated as usual, although on Sundays the more solemn Liturgy of St. Basil the Great is used in place of that of St. John Chrysostom. One book commonly read during Great Lent, particularly by monastics, is The Ladder of Divine Ascent, which was written in the seventh century by St. John of the Ladder at St. Catherine's monastery on Mt. Sinai. Like Western Lent, Great Lent itself lasts for forty days, but unlike the West, Sundays are included in the count. It officially begins on Monday seven weeks before Easter and concludes on the eve of Lazarus Saturday, the day before Palm Sunday. However, fasting continues for the following week, known as Passion Week or Holy Week, up until Pascha or Easter Sunday. Both Lent and Great Lent are times when the Christian participates fully in preparing himself to praise and glorify his God as Lord and Savior. This period of forty days is like a "workshop" where the character of the faithful is spiritually uplifted and strengthened; where its life is rededicated to the principles and ideals of the Gospel; where the faith culminates in deep conviction of life; where apathy and disinterest turn into vigorous activities of faith and good works. Lent is not for the sake of Lent itself, as fasting is not for the sake of fasting. They are means by which and for which the individual believer prepares himself to reach for, accept and attain the calling of his Savior. Therefore, the significance of Lent is highly appraised, not only by the monks who gradually increased the length of time of the Lent, but also by the lay people themselves, although they do not observe the full length of time. As such, Great Lent is the sacred Institute of the Church to serve the individual believer in participating as a member of the Mystical Body of Christ, and, from time to time, to improve the standards of faith and morals in his Christian life. The deep intent of the believer during the Great Lent is "forgetting what lies behind and straining forward to what lies ahead, I press on toward the goal of the prize of the upward call of God in Christ Jesus," (Philippians 3:13-14). ↑ The Anglican Catholic Church: The Liturgical Year—Lent Retrieved May 4, 2008. ↑ Spirit Home: Lent—disciplines and practices Retrieved May 4, 2008. ↑ Lent & Beyond: Dr. Peter Toon—From Septuagesima to Quadragesima Retrieved May 4, 2008. ↑ F. M. L. Thompson, The Cambridge Social History of Britain, 1750-1950 (Cambridge University Press, 1993), 251. ↑ Summa Theologica Q147a8 Retrieved May 4, 2008. ↑ Sacred Destitations Travel Guide: Cathédrale Notre-Dame (Rouen Cathedral), Rouen Retrieved May 4, 2008. ↑ The Restored Church of God: The True Meaning of Lent Retrieved May 4, 2008.